Each time a standard solution emerged, innovation didn’t stop. It just allowed new innovation to begin at a higher level. In this post I want offer a solution stack for Entrepreneurship. It’s the combination of Business Model Design and Customer Development. Today every business organization from startup to large company uses the words “business model.” Some use it with certainty like they know what it means. Others use it with an implied question mark realizing they don’t have a clue to its components. 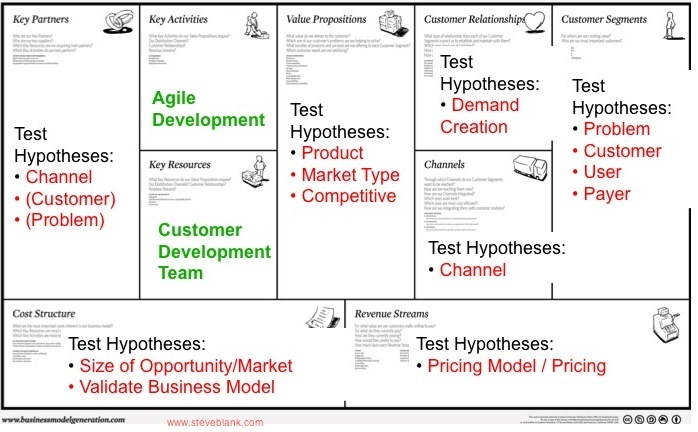 Yet as powerful as the Business Model Canvas (a template with the nine blocks of a business model) is, at the end of the day it was a tool for brainstorming hypotheses without a formal way of testing them. One of the key tenets of Customer Development is that your business model is nothing more than a set of untested hypotheses. Yet Customer Development has no structured and systematic way of describing a business model. In the last year I found that the Osterwalder Business Model canvas could be used for something much more than a static planning tool. I realized that it was the launch-pad for setting up the hypotheses to test, and a scorecard for visually tracking iterations and Pivots during Customer Discovery and Validation. Meanwhile on the other side of the world Alexander Osterwalder was coming to the same conclusion: tying the two processes together would create a “strategy stack for entrepreneurship.” We got together this weekend (along with our partners Alan Smith and Bob Dorf and my student Max Marmer) to try to integrate the two. In its simplest form the way to think about the intersection of the two processes is that you start by designing your business model. 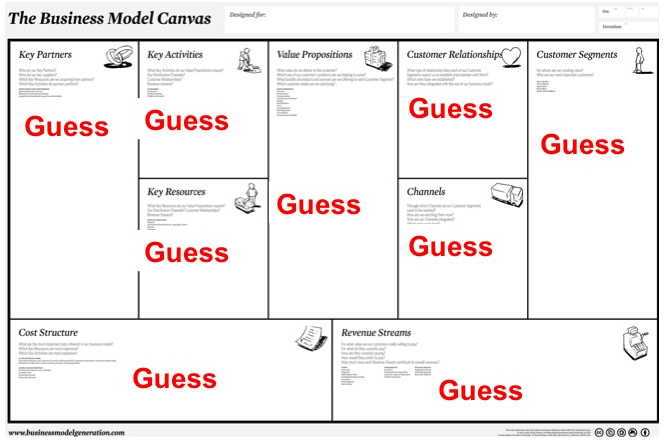 Next, each one of the 9 business model canvas boxes then directly translates into a set of Customer Discovery hypotheses that are described in Customer Development and the Four Steps to the Epiphany. Many entrepreneurs assume that the assumptions in their original business model (or business plan if they wrote one) will be correct. Confronting the reality that one of these hypotheses is wrong (finding out you have the wrong sales channel, revenue model, target market or customer) creates a crisis. 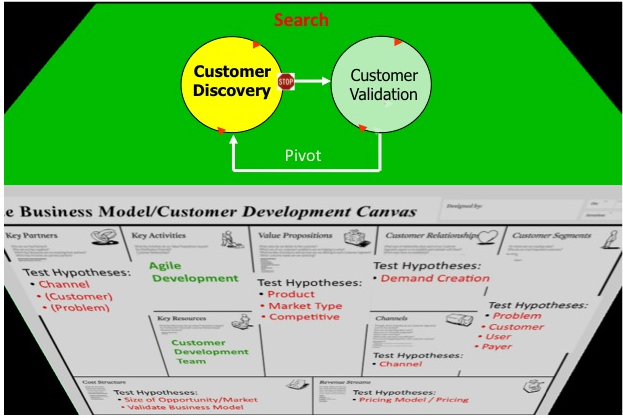 Tying Osterwalder’s Business Model Canvas with the Customer Development process turns these potential crises into learning opportunities called the Pivot. Customer Development forces you to get out of the building and discover and validate each one of the assumptions behind the business model. A Pivot is when reality leads you to change one or more business model hypotheses. The result is an updated business model not a fired VP of Sales. The Pivot turns a failed business model hypotheses into insight. We’ll have more to say about combing these two methodologies in future posts. As well it should. Competition is relevant when there are known business models competing for a piece of a known market. Worrying about competition when designing a new business model is at best a waste of time and at worst a red herring that will steer you away from focusing on customer development. This is the case 100% of times. You really have to micro-segment again and again to define a market (or a sub-sub-sub-market in this case) that is both unchartered and void of competitors. Of course, its size is then ridiculous. I’ll take the absolute contrarian view of your proposal. You HAVE to factor in competition when designing a new business model. All competitors, direct ones and indirect ones. For one good reason: customers have the choice. If you don’t differentiate because you forgot to differentiate, then they’ll stick to the existing more comfortable alternatives. Let’s take another example. It is very, very hard to change a pricing policy, or a brand, or a sales strategy. All this “pivot” and “flexible business” yada yada is probably good for Internet B2C startups that can change value proposition overnight by laying out another design in expectation of more superangel money. But Internet B2C Startups most of the time have no well thought business model at least in this framework way. All the other tech businesses require at least some well thought plan before moving forward, and changing their plans if something goes wrong. Then how to articulate Customer Development, which is dynamic and iterative by nature, with the Business Model framework which is static and one-sided? Sounds hard to me. With all the respect due to Steve here, tying 2 buzz words together doesn’t make a super buzz. Please show me where Steve is arguing for a static business model; I think he is suggesting quite the opposite. My assumptions: 1) most startups fail due to lack of customers. 2) competition is defined as another company that seeks to convert the same group of (mutually exclusive) customers that you seek to convert. 3) Product substitutes are not competition, but a form of non-adoption. Given those assumptions, my argument is that business models must be designed to address non-adoption because customers must be convinced to use your product rather than a substitute before they even consider making a decision between competing products. Just a quick (and very overdue…) comment. From practical perspective, this difference is trivial. As long as customers are using a different product for the same need, the implication is the same. Hence, it does not make difference if you call it “direct competition” or “indirect competition” (i.e. substitutes). Non-adoption is when they are not using a product at all to solve the problem. Youngme Moon who teaches at Harvard Business School recently wrote a book called “Different” which talks about how companies try to differentiate themselves but then their competitors soon offer the same thing and to the customer they all appear to have very similar offerings with little differentiation. What would be the difference between business model definition and strategy definition, if you were to include competition? The concepts are, and should be different as David mentions. They are different activities in diferent stages of your development. As customer development and business model are also different stages. The aim of the first is to validate your value proposition, that will give space for the first bm development. I’d agree if you’re referring to competitive saturation. However, the BM canvas is a great tool to flesh out the competitive models – using them to spot weaknesses, inefficiencies and springboard differentiation discussions. Interestingly Saras Sarasvathy research on expert entrepreneurs. Those that have started multiple companies and had at one successful IPO with turnovers between $200 million to $6 billion found that none of them considered competition and believed it was irrelevant until you actually had traction on an idea. I disagree, you consider competition in the first step… value proposition. Your value proposition should consider competitive sets/differentiation in order to validate how compelling your business idea is. I appreciate how you’ve rendered something conceptual & static, like a business model, into an actionable framework for a proving ground. The Business Model / Customer Development Stack seems akin to a pilot’s pre-flight checklist. With this framework, startups can pursue & prove viability…Or realize early in the checklist that “Uh, we have a problem, Houston”, then adjust accordingly. I look forward to further posts about the Business Model / Customer Development Stack. Thanks! Looking forward to seeing more of this! Been following Alexander for some time and getting introduced to more interesting things every time! May I add that the most crucial hypothesis will not be about what is in the boxes, but about the relations between the boxes. How can the VP be turned into a RS? And how can the KA, KR and KP deliver a compelling and unique VP? And how can the RS be >> CS? I’m looking forward to see Alexander Osterwalder at the Entrepreneurship Summit 2010 in Berlin. Thank you so much for this post. I am currently working on a workshop to teach students techniques how to think about developing a business model and starting a business in a structured way. I was already planning to use Osterwalders and Pigneurs book and model as a template. After reading through the material though, I realized that the approach was missing good instructions on how to test all the assumptions (guesses). Your customer development method is indeed a perfect fit to fill this gap. I am very much looking forward to read further thoughts on combining the two methodologies on your blog. I wish Steve would have taken the Dashboard strategy championed by Randy Komisar. Starting with some basic business ideas and leaps of faith that need to be tested seem a better fit with Customer Discovery. Why spend time on a detailed Business Model (not plan) if you don’t get any positive early feedback. Perhaps this synthesis is a good idea at some point, but I’ve struggled seeing how the Business Model helps me from the start. I’ll look forward to updates. Do you know where I can find out more about Randy Komisar’s dashboard approach? Ostterwald’s formulation reminds me of Newton’s dot notation for calculus (fluxions or derivatives). It points out the need for a formal notation but it’s too cumbersome and not usefully extensible. I don’t question the need for meaningful and portable representations of business models, and the canvas may be the best thing we have today, but I think it will represent an evolutionary dead end. I think a good thing to consider is one of the ways Alex recommends his Canvas might best be used … up on the wall, in front of the team trying to define their model. 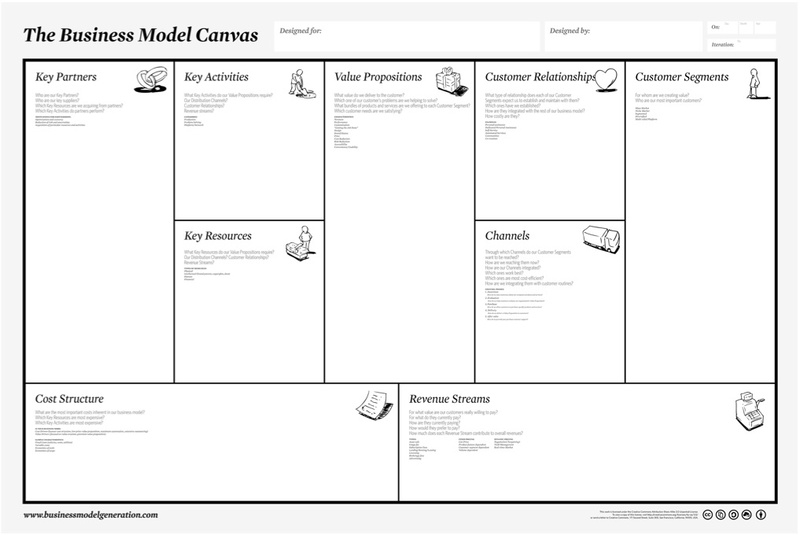 It is a great visual tool to pound out the major moving parts of the business model. I think of how a scrum board with Post-Its is an abstraction/model of the process — you can look up and see where the work is. It can also serve as a decent collaboration/discussion tool as you talk out your model (or your competitors’ models). As for competition, I find it’s a decent tool for putting together how the competitors function, and from that getting a better understanding of exactly where differentiation is possible — think of it as a less abstract SWOT, where you can see the strengths and weaknesses as they operate. Alex and Steve’s books are two discoveries I made towards the end of business school that, along with some of what I guess are the “classics”, really stayed with me after graduation. Also … I’ve seen customer development slides start to show up lately in Seattle, but have been wondering whether the canvas will get more traction with the local startup crowd. Thanks, Steve — this post helps me put together how the two tools resonate with and complement each other. I am a bit of an Osterwalder fanboy these days (two copies of the book next to Blank’s) and of course YMMV — but I recommend taking it for a spin to see if it helps. Quite interesting.Monday we started the same approach (on combining #BMGEN and #CustDev). 6) Now, bring up your customer-hypothesis and do the “Rüttel-Test” again. So you will pivot your assumptions to the next higher level. 7) Leave the Building and test you assumptions on the market. 8) Now repeat steps 5) to 7) as long as it is necessary. Thomas, what is the Ruttel test please ? OK!! I own both “The Four Steps to the Epiphany” and the “Business Model Generation book”, but I have to admit I have been focused on the Four Steps and haven’t crack the Model Generation book. Now I’ll combine the two along with my notes, webpage links and other media in Evernote running on my Android phone so I can document and test my business model. I think this approach will be more convenient than an iPad application, unless the information in the iPad application is stored in the cloud and accessible for anywhere and any device. This seems like an important step towards the elusive living business plan. What’s convention for using colours in the canvas. I can see here green and red, but I also saw yellow and blue.